As I have not had too much time to share style posts, I thought that I would share with you a look that I wore weeks ago. Also, a massive "thank you" goes out to you dear readers for the overwhelmingly lovely birthday messages, comments, and wishes. For this outfit, I needed to change quickly into something presentable right after working out, however I didn't need to be fancy or anything. My only destination was meeting a friend for coffee after a long work day and a gym session. I swapped my clutch for a utility messenger bag and my heels for a more sportier shoe, a colourful running cross-trainer! Comfort and style was the overall tone that I was going for. 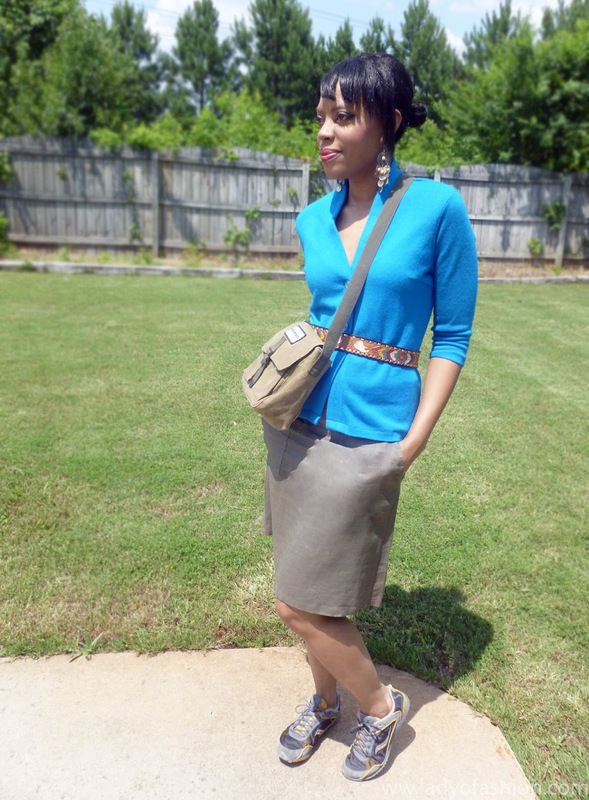 I changed into this linen utility skirt that I have actually had for a couple of years, then added a cardigan knit that I designed and sewed many years ago. Therefore, much of this outfit is a considerable amount of remixing versatile pieces that I've not worn in quite some time. There you have it, an easy transition for casual wear. For me, versatility is everything these days! Gorgeous outfit and I like your blue top! Those sneakers look great with the pencil skirt!!! I love the color combination!! Have a great Monday Madison!!! Hi sweety, I like your more levant take on the sportswear trend, the belt is so pretty and works really well with the lovely cardi. Hope you had a wonderful bday! love your sneakers...cool skirt and I like the cardigan! This shade of blue looks awesome on you, Madison:) And hope you had a fab bday celebration! Hiya there Madge, yes I designed it sewed it all the above. I used to be a fashion designer. Thanks so much for your lovely comment. Love the transition to casual wear! You look so cute. Hello dear, hope you enjoyed your weekend. I love the sporty and casual tone you've bought to this look and I also love how the khaki looks against the blue :) wonderful look as always dear. It's a great outfit Madison. It's simple, comfortable, yet looks pulled together. Love your sneakers! I really love the cut and the colour of the cardigan! So great that you made this yourself. versatility indeed! I know what you mean. Some days, I wanna just change one thing up with what I already have on and then out the door again! :) Your self made cardigan is cute! I LOVE the color! I never incorporate my trainers with everyday clothes--- but maybe this is something I should play with! Thanks for the inspiration! Happy Belated Birthday! Hope you had a wonderful time sweetie! I love this outfit take on versatile sportswear and LOVED your denim shirt/frock outfit from previous post too! You're looking really well! You know what I love about this look? As you say it, it's versatile, but you're showing us a 'real' life scenario. So many times, I wonder if fashion bloggers really dress the way they do because it seems so uncomfortable. You're showing us how to transform a look, in the middle of the day, to make it more suitable for a certain occasion. I love that! I think you pull it off greatly for a casual coffee with a friend. Keep up the fantastic work!! I'd love to see more of similar posts, like how to make use of your clothes after a night of shame haha. versatile and realistic! love it! love that pretty blue on you!! You are the best at accessorizing I swear! I love how you worked a skirt into a more casual/active wear kind of outfit. I never think to do this, yet I imagine it would be perfect for those days on the run. 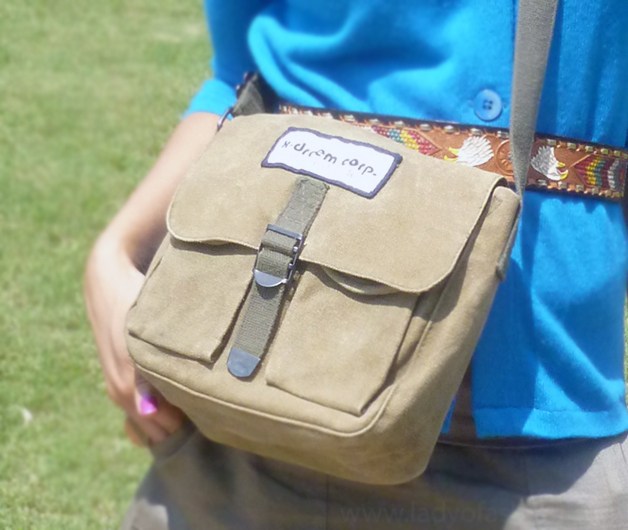 That is one cool bag too! Love the sneakers and skirt! Hope you had a good b-day! oooh love the colors here and you look so chic! Super style ! Amazing mix ! Thanks for sharing this outfit post. Love the detailed belt over the cardi. What a fantastic look! I really love the way you transformed it into a more casual look from your work wear! The skirt is incredible! That blue is amazing on you! You are so talented Madison! That top is pretty fabulous and i hope I can learn to sew and create something like that some day! Such a fun outfit. I like how sporty it is, but still so cute! Refreshing to see casual chic with a dose of panache! I love your trainers. I am in the market for new ones and the colors in yours are perfect! This is such a great look Madison. I like the colors so much. And it is such a pleasure to see that you have combine it with sneakers. I love how a few simple changes can make your dressy outfit nice and comfy casual. I like your effortless style, you look great! And I'm right with you: versatility is the most important thing for clothing! This is such a cute and fun look. I love it! The blue plays great against the neutrals. You look great! cute outfit! i love the blue on you such a gorgeous color!! so stylish - love it! Super cute, I really love the belt and those comfy chic shoes do the trick perfectly! Such a cute look. Love the details of the belt and the bag. such a great take on sporty look. I like that you kept it feminine and elegant. That blue looks so great on you! I am not a fan of tennis shoes but I have to admit, you did a great job with this look. I love the mix, the cardigan is gorgeous. Lovely shade of blue on your cardigan! Das ist ja toll, wie du das kombiniert hast, ich habe mit Turnschuhen und einem Rock noch nie so gut ausgesehen, Wahnsinn, gefällt mir total gut, wie du das zusammengestellt hast! Wow, Danke! Haha, Ja, das war diese Kombi, ein Spaß Alternative (mit eine "sportlich-chic") Outfit! :-) Auch, Ich finde die Schuhe sehr Komfortable! Oh, happy belated birthday! I love this sporty look--the electric blue looks great on you! Love this look :) I really like how you manage to make a casual outfit glamourous with the pops of colour and especially the belt! Love this top on you. Great design! 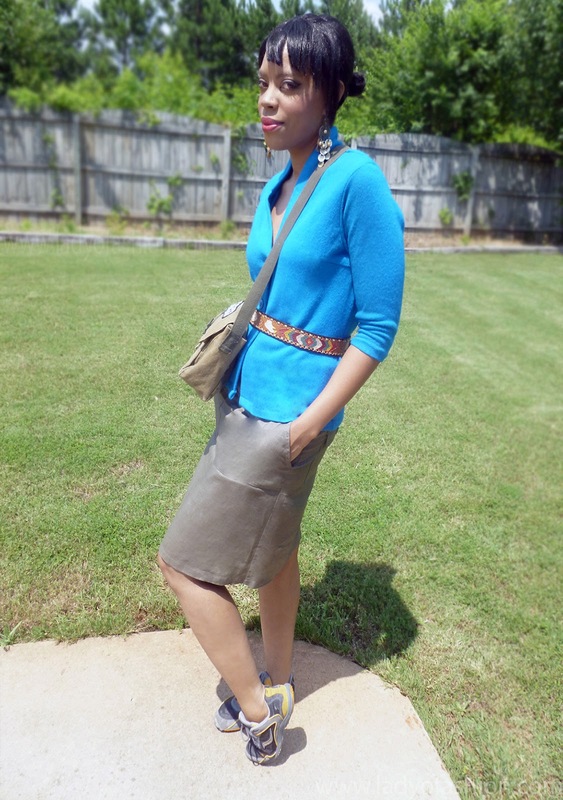 I love the bright turquoise on you and agree - versatility is so important! Sieht richtig cool aus, gefällt mir total gut! cute saucony's!!! i recently just bought some nike's that i love! That colour blue is gorgeous on you! So nice! I'm a fan of the training shoes trend as they can add a quirky, relaxed touch to the look and they are so comfortable!